Got some spare picture frames hanging about around your home or simply looking to pull off your next DIY/crafty project to spruce up and try something different within your home? Well we believe in the diversity of picture frame use which is why we have pulled together this list of the top 19 ways to reuse, recycle or repurpose picture frames. Want a unique look in the bedroom at little cost? We love these frame headboard ideas; Vintage Rivals went all the way and produced a gorgeous tufted headboard using a gigantic picture frame and upholstery fabric. 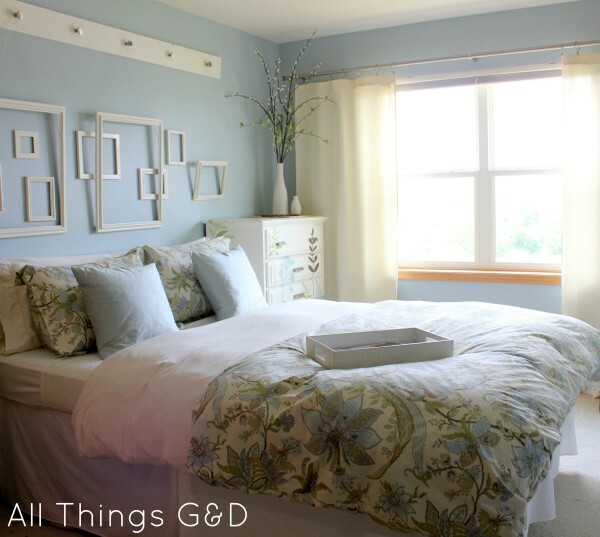 Dusty at All Things G&D took a different route and created an abstract headboard using layered empty picture frames which produced a wonderful contemporary look, adding a 3D feel to the wall. A common find in the shops but at a costly price is the shabby chic style picture frame chalkboard. These are a great recycle opportunity for old picture frames, and with a quick lick of paint and chalkboard covering you can create your very own for a few pennies. For a full tutorial visit: The Frugal Homemaker. Perfect for simply decorating a table with ornaments, or even use as a handy desserts tray, this is a great way to turn your picture frame into a statement but also useful piece in your home. Take a look at Kristie’s blog for a great step by step guide to creating your own tray. Top Tip- Want a bolder look? Paint up your frame in bright white and use a striking pattern within the frame and perhaps match to your colours in your room. 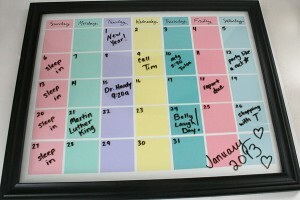 We absolutely love this idea from Momspark for a reusable calendar. 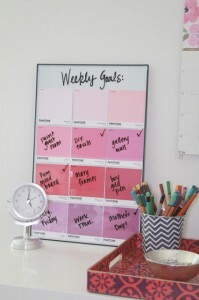 And all you need to create it is a large picture frame, some coloured paper and a dry erase pen to mark on your dates each month. For a great way to pin up those must-keep notes, why not use this tutorial from HowDoesShe to create your own hand-made corkboard. All you need to do is get your hands on some corkboard, fabric and secure it against your frame; we particularly love the colours these guys have used! 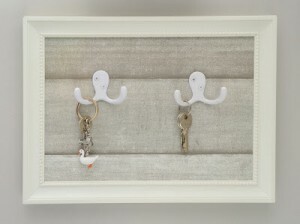 A great simple DIY project a key rack can be made with just a picture frame, supporting cardboard and some decoration for your back panel e.g. 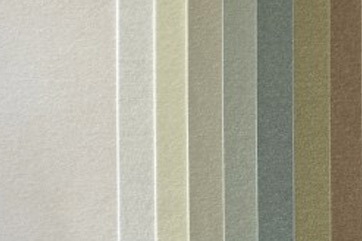 wall paper samples. (Check out Lara’s example). Using a blank frame and scrap pieces of MDF board Shanty2Chic created these wonderful frame shelves, a great idea for utilising space on your walls in a visually unique way. 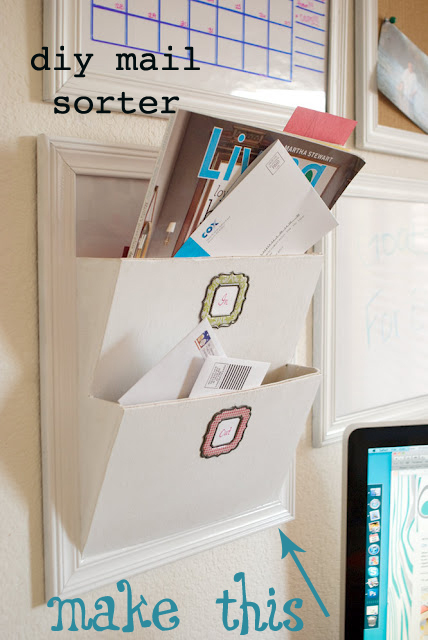 Make a DIY letter holder using a picture frame and some scrap bits of plywood. LadyGoats supplies some handy templates to make your own. Similar to the decorative trays, create your own personalised vanity tray perfect for holding your dresser or bathroom bits and bobs. Visit Lil Blue Boo for a tutorial on creating your own. 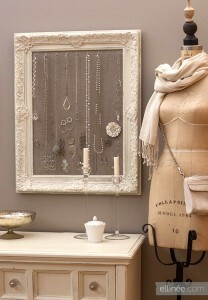 Looking for somewhere to hang your jewellery and store your earrings? Lia at Elli.com came up with this tutorial to create a DIY antique jewellery holder. 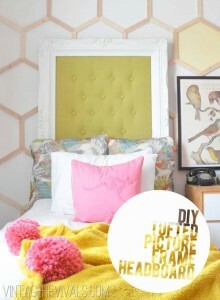 Top Tip: Match colours to those already in your room for a ‘put together’ look. Not sure what to hang on your wall? 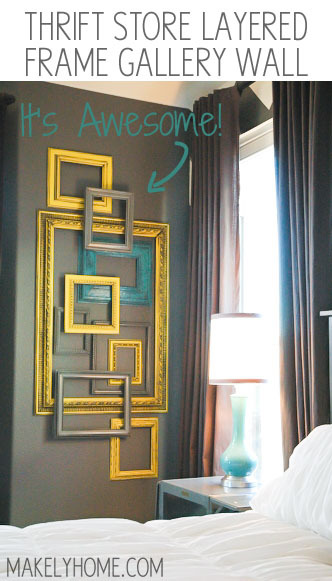 Empty picture frames make a great solution; look to group together frames of different sizes and designs, overlapping or hanging ornaments within to create a striking feature on your wall. We love Makelyhome.com’s example below. 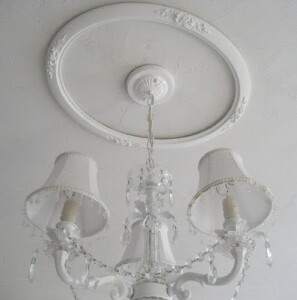 A much lighter and cheaper alternative to a ceiling medallion, buy yourself a large decorative picture frame to place around your light fitting like Passionate for White has done below. 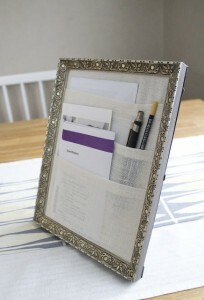 Turn a frame into a desk organiser using fabric shaped into pockets. Take a look at the amazing results Wishfultinker achieved with some fabric and glue here. 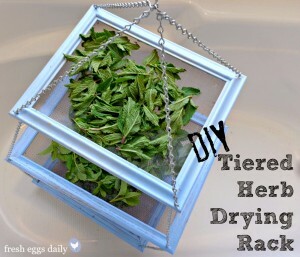 This great idea for a herb drying rack comes from Fresh Eggs Daily. 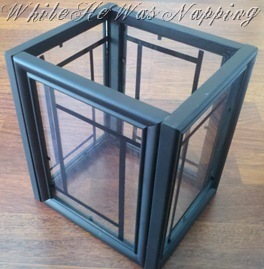 To make your own you’ll need 3 picture frames of differing sizes, a length of chain and some window screening or alternative. 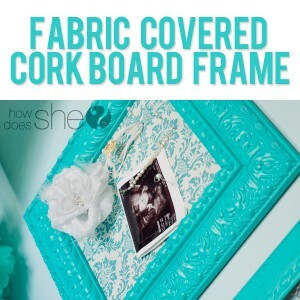 Shannon Claire created this great memo board using just a frame and the free sample paint chips you get from the DIY store. Bring the outdoors in with wall flower framing. To create your own floral feature grab yourself some relatively large frames of different sizes and things such as small jars and bottles to act as vases and hang within your frames using twine. Add your flowers for the finishing touch. Create your own ‘lantern’ using four identical picture frames; probably best to pick these up from a pound store and join together using vinyl strips. These lanterns are great both for candles (top open!) but also filling with flowers, shells, ornaments or similar; a wonderful mantel piece. 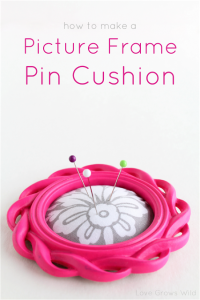 Small but mighty, create your very own pin cushion using a pretty picture frame and a bit of fabric. Looking for a bigger project? Why not try building your own children’s chair using pieces of pine or another suitable material, 2 picture frames and your choice of fabric like they’ve done here at Apartment Therapy. Have you tried out your own picture frame crafting/recycling or had a go at any of the tutorials above? We’d love to know! Visit our social pages and drop us a message or share your DIY project photos with us on Facebook, Twitter or Instagram.